MIRABEL, Que. — They came to Mirabel, Que. on a mission to become Team Canada and on Saturday afternoon Whalley, B.C. did just that by defeating Glace Bay, N.S. 11-0 in the championship game. Now Whalley will don the Maple Leaf at the Little League World Series, which is set to begin in one week in Williamsport, PA.
"This feels amazing," Whalley's Kai Sheck said. "It's pretty cool. I'm lost for words right now. We worked hard for this. I've been dreaming [about] this forever." Sheck comes from a long line of great baseball players, including his great grandfather who once played for Whalley and his grandfather who played Major League Baseball. Sheck's mother, Danna, was in the crowd watching her son win the national title. "I think it's about the support. My kid can feel it," Danna said. "This is the Canadian baseball dream and we're living it now." When the final out of the game came after just four innings, the players from Whalley raced out of the dugout and hustled in from the outfield to join in the celebration. For many, the moment was years in the making. Head coach Mike Marino was emotional after the game. His son Joey is a member of the team and Marino himself once played for Whalley. "We have to enjoy this time right now. We're the best team in Canada," Marino said. "We've been working at this since the boys were eight years old. We set a goal then and now we've fulfilled it." This is the sixth national championship title for the Whalley program, tying them for second most in the country. Marino says the reason they've been able to be successful for so many years is due to the fact that players and parents continue to give back once they go through the program. "We're a small association but it's the people who come back to make this what it is. We just keep doing our thing and winning games. We're like the little engine that could." Marino also credits the high level of baseball in B.C. to helping their team become the team they are today. The province has captured 13 out of the last 14 national little league titles. "We were a pretty confident team coming in. Once we got out of B.C. we knew we were ready for this tournament." Whalley was untouchable throughout this year's tournament winning every game they played, including four of their games finishing early because the 10-run rule. 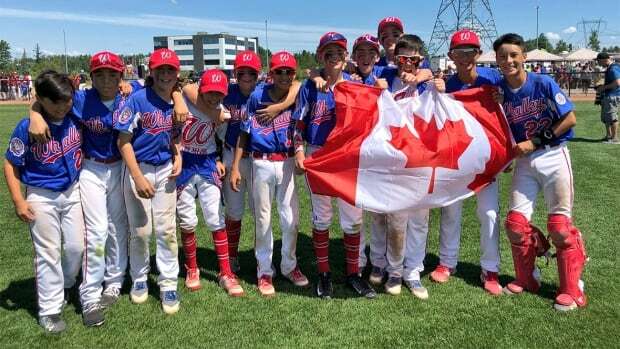 Whalley is now heading to the prestigious Little League World Series in Williamsport, PA. Their first game is scheduled for Aug. 17 against Panama. No Canadian team has ever won the World Series — the closest Canada ever came was in 1965 when Stoney Creek, Ont., lost in the championship to Connecticut. Marino knows they have a tall task ahead of them but says the team is going to represent Canada to the best of their ability. "We're going there to win," he said. "We're going to go there and enjoy it, but we're not going to lay down."